People will ask, “What kind of car is that?” We designed the 2017 Camry for those who dare to be bold, and with its striking hood lines this is one ride that commands attention. So get inside‐it’s time to let everyone know you’ve arrived. Camry XSE comes standard with 18-in. alloy wheels.7With their gloss-black finish and machined finish accents, get ready for stares. Driving enthusiasts will appreciate Camry’s front sport seats. With side bolsters that cradle the driver and available Ultrasuede® seats, Camry delivers bold performance that helps you enjoy the drive even more. Come on in and get comfortable‐Camry has got plenty of room. We sculpted cutaways in the seats and interior panels to help provide more knee and leg room for passengers front and rear. Up top, the headliner was shaped for greater head room throughout the cabin. Camry was designed to thrill. Its available 3.5-liter V6 puts 268 horsepower under your right foot, making it one powerful ride. Camry is always up for some fun. 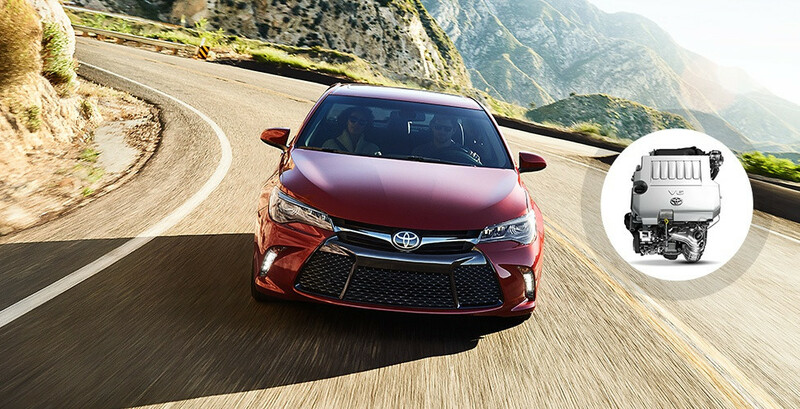 With recalibrated springs, shocks and sway bars, and optimized Electric Power Steering (EPS), Camry’s taut suspension delivers precision performance, a smooth ride and breathtaking handling. No wires. No mess. Total convenience. Available on Camry, the wireless charging system lets you simply place your Qi-compatible device on the nonslip surface to charge up wirelessly. Keep track of the driving information you use most with Camry’s standard Multi-Information Display. Easy to view from any angle, this customizable full-color screen shows features like incoming call information, available turn-by-turn navigation, current fuel economy, available Dynamic Radar Cruise Control and more. When the available Blind Spot Monitor detects a vehicle, it illuminates a warning indicator on the appropriate sideview mirror to help you know when it’s safe to change lanes. Rear Cross-Traffic Alert works in much the same way. When you slowly back out of a driveway or parking spot, it provides audible and visual indicators to warn you of approaching vehicles.